WEST WINDSOR – As a junior Music major at James Madison University, Alice Weiss walked into the studios of public radio station WMRA not realizing it would be the first of decades of service in the not-for-profit radio industry. But looking back, she wouldn’t change a thing. "I volunteered to host, with no radio experience, with a very involved program director who ran the board," Weiss said. "The more I did it, the more I loved it. I had great fun there, and decided to pursue classical music radio after I graduated." And Weiss has done just that for more than three decades, with a path that has lead her from Virginia to Prairie Public Radio in Bismarck, N.D.; WNED, Western New York Public Broadcasting, in Buffalo, N.Y.; and then to WWFM The Classical Network on the campus of Mercer County Community College, where she recently celebrated her 25th anniversary as program director. Considering that a program director with a tenure of even five years is rare in commercial radio, Weiss says she is fortunate to have landed at a radio station with solid listener support and a top-notch staff. And even though at one time she considered venturing into commercial radio, Weiss feels comfortable in public radio. "We have had a tremendous and passionate staff over the years, with each individual bringing a unique skill set," Weiss said. "And the listeners have really responded, and appreciate the diversity of programming WWFM has to offer. Unlike commercial stations, we don’t depend on ratings to make the next programming decision." But Weiss notes that programming decisions have to be made just the same. When she arrived at WWFM in 1988, the station was only five years old and split air time between two formats – classical and jazz. But considering that there were other outlets for jazz music programming, there were few stations dedicated to classical music. And none that offered 24-hour programming. "My first year here (at WWFM), it became apparent that the demand for classical music was greater than jazz, and in 1990, we made the decision to go to all classical," Weiss said. "Shortly after, we went to 24-hour operation. It’s much easier to promote and program a one-format station." WWFM is the only station in New Jersey with a 24-hour classical music format. Although it may have seemed like a drastic change at the time, it would prove to be relatively minor compared to what was ahead in the next two decades. Around the turn of the century, there was the gradual transition from analogue to digital, and with it, the introduction of computers in the on-air and production studios and training for hosts and production staff, as well as the changeover to high-definition (HD) compatible station transmitters. Shortly after current WWFM General Manager Peter Fretwell joined the staff, the station introduced HD radio, which made it possible for jazz to return to WWFM through "JazzOn2," and the expansion into the New York and Philadelphia markets. "We were excited to have a general manager that really embraced new technology, upgraded systems and made sure we had state-of-the-art equipment," Weiss said. "Through Peter’s leadership and vision, WWFM has increased its ability to offer listeners more programming through multiple program streams and new musical partnerships with our region’s most prestigious music schools and professional performance organizations. "Our expansion to New York and Philadelphia via HD2 stations has been a significant move towards broadening our reach to new audiences." And while the expanded reach of WWFM has certainly been a contributing factor in the success of The Classical Network, Fretwell is quick to give credit to Weiss for her approach in developing a staff that is knowledgeable, dedicated, and connects with the audience. "If you ask me to cite the reasons WWFM has assembled such a remarkable staff of experts over the years, the list won’t include wealth, fame, and facilities," Fretwell said. "Alice’s conscious decision to allow her hosts to program their own music would be at the top of the list. "The hosts create the unique content, but the freedom to create that content traces back to Alice’s unusually mature and selfless approach to classical music. WWFM would not be what it is today without her." Rachel Katz, WWFM production manager and host of the arts and culture program A Tempo, notes that Weiss’ has contributed to the success of WWFM by leading by example – as an announcer, as well as a program director. "Alice has helped craft the sound of WWFM over the past 25 years in her role as program director, choosing programs that reflect the many sides of classical music," Katz said. "As an announcer, she presents many of the most beloved works in classical music, and her cheerful voice has made her a listener favorite." Weiss, though, is determined to look forward – not back. 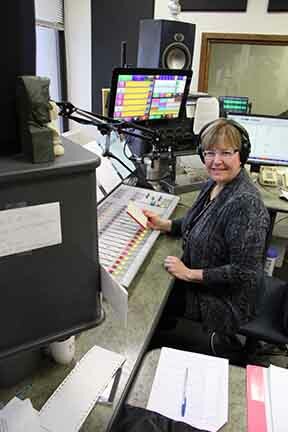 She notes that there have been a lot of changes since her first air shift on the James Madison campus, as the WWFM main studio is twice the size, with soundproofing tiles on the wall instead of carpet. Gone are the cartridge decks for playing public service announcements and sponsor credits, reel-to-reel tape decks, and the analogue switching equipment. With the growing popularity of internet radio and online sources, such as Pandora and iTunes, Weiss said there will be more changes in radio and in the ways people access their favorite music. But she also looks forward to the challenge of keeping up with the times, and providing listeners with quality classical music programming. "The industry changes so very, very fast," Weiss said. "While FM radio is still a popular vehicle for music and informational listening, it is not always the medium of choice for many people. There are so many new ways to listen to your favorite music. We have to keep up with the times. "I really love the mission of public radio and the service it provides its listeners. We can spend time on programming choices commercial radio couldn’t touch. When someone calls or sends an e-mail saying a particular musical selection really inspired them, it makes it all worth it."